Today, I end my term as December Guest Designer for Embellish-It. For my final project, I wanted to do something a little different. 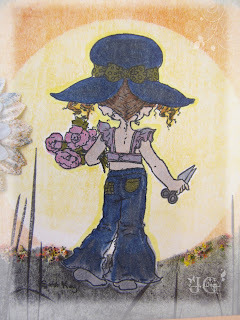 During my blog travels, I had seen a card where the image was grayed out, indicating that the character was shadowed. 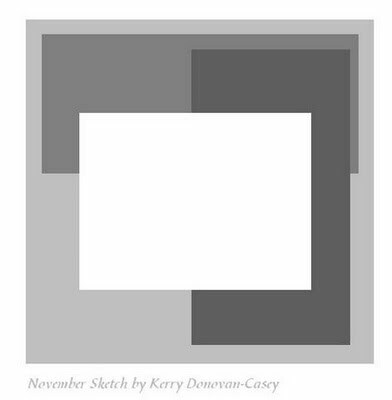 I wanted to find a way to portray this shadowing. So I made this card. 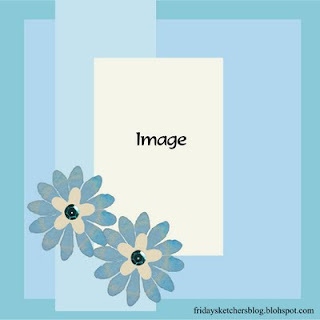 The image is Spring Blossoms by Sarah Kay. I used Copics to color her. 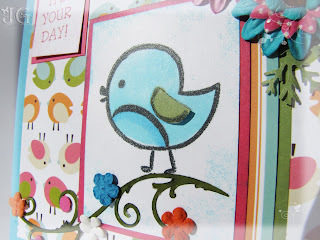 I used my brayer and Stampin' Up! pads to brayer the background. I used Black Magic Paper (sorry, but I hate the name of that paper) for the base, and sanded off the black to reveal some of the blue core. The next layer is Blue Skies from American Crafts. I used the Zindorf masking method to create a sunset. With the imaging facing the sunset, I figured her back would all be in shadow. So, I used Copics to color my image, and then went over the entire image with C3, C5 and C7 (depending on the level of shadow I wanted). To finish off the card, I added a little Flower Soft, some rhinestones, and a flower with a little Flair from American Crafts. The speckled flower was originally white, but I wanted to add some color. I layed the flower down on my Brocade Blue Dye ink pad and used a paper towel to press the flower into the pad, adding some blue. I repeated this with Pumpkin Pie. 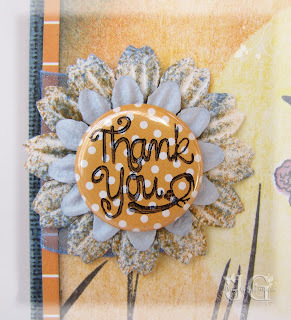 I stamped "Thank You" on the Flair with Staz-On. I have so enjoyed my time working with Embellish-It. The ladies are wonderful, and Barb (the store owner) has been just great. I have had the opportunity to order some stamps from her. She has great sales and excellent customer service. She is currently offering Free Shipping on domestic orders of $50.00 or more! Enter code 4SP9HD in the coupon box at checkout! (One discount per order). I hope you will check out her store, and tell her I said hi! 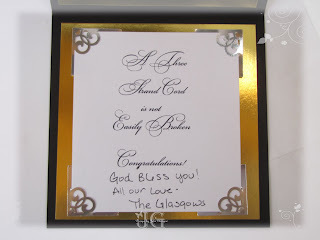 I made this card for a lovely couple at our church who are getting married today. I did not used any stamps on this card. I made the sentiments on Photoshop. 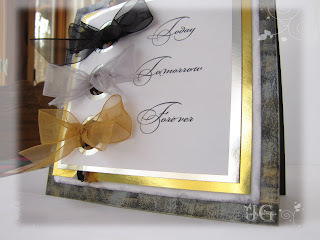 I used black, white, gold and silver cardstock. I wanted to represent the three strand cord being hard to break, so I braded ribbon, and used the ribbon to tie bows. I used metallic paint to distress the edge of the black cardstock. PS: In response to the question about the font used, I used Bickham Script 2 and Bickham Script Fancy. 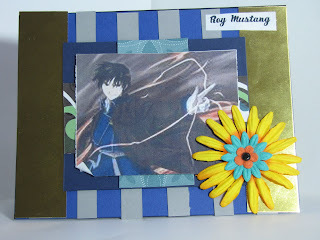 It is a quick post today, but just wanted to show you this card. Have a great evening. I just wanted to share one little thing today. My DD made this card for a friend. It thought it turned out really cute. She used an image from online. 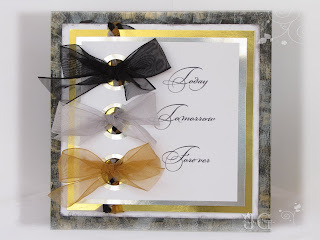 What I love on her card is the metallic gold edges that correlate with the stripes. 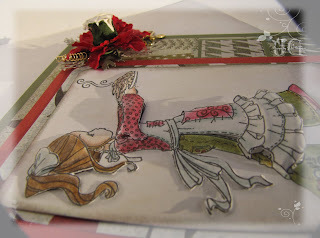 Having been a stamper since her birth, it is really fun to watch her come into her own with card making. She has her own style, and I am loving watching her flourish. Here is the story behind this card: One of my favorite groups is Straight No Chaser, especially their version of 12 Days of Christmas. (If you have not seen it, view it here. It is worth the watch). My daughter and I have been listening to that nonstop this year. 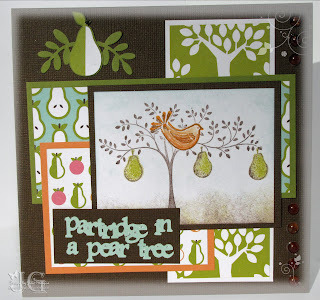 So, when I got my Blue Skies paper and saw the wonderful pear papers, I just had to make a partridge in a pear tree card. It took some thought, but I finally came up with combining my Martha Stewart Christmas Stamps and made a partridge in a pear tree. I decided to give it to my DH since the song says "my true love gave to me..." and he is my true love. Embellish-It still has some awesome sales going on. 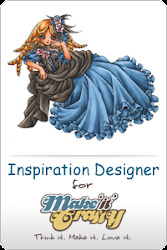 She is also offering Free Shipping on domestic orders of $50.00 or more! Enter code 4SP9HD in the coupon box at checkout! (One discount per order). Go check it out before time runs out. I want to with you all a Wonderful Christmas. I hope it is filled with joyous times with friends and family. See you next week. 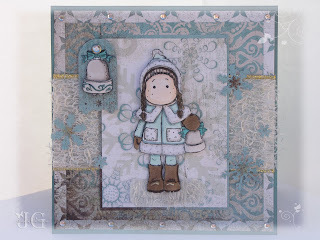 The challenge for Magnolia-licious Highlites for December is to make a card in a shape other than a square or rectangle. 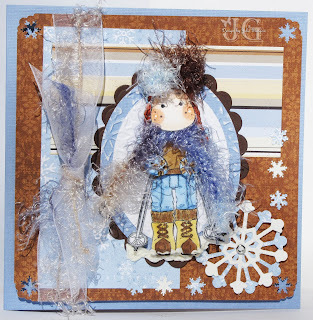 So, I decided to use my Sizzix Snowflake #2 die to make a snowflake card. To help make the snowflake sturdy, I started with white cardstock, and then used my Xyron to add adhesive to my designer paper (from Stampin' Up! - retired) and stuck the paper to the cardstock. I used Tilda with Dalecarlia Biggin. 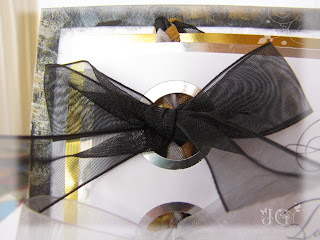 The scallop circle is silver metallic paper from my stash. I finished it off with rhinestones. Have a wonderful holiday week. I made this for the Embellish-It Friday Free For All Challenge #73 - Let It Snow. The challenge is to use snowflakes. So I decided to make it my focus. 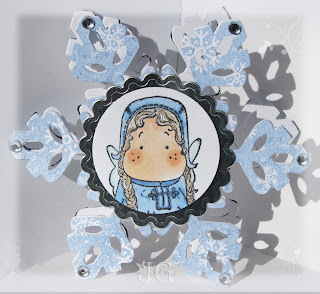 The snowflake is a Sizzix die cut from Stampin' Up! called Snowflake #2. The paper is LilyKate by Basic Grey and the stamp is Lucy and Kitty by Sarah Kay. The scallop background is silver metallic paper from my stash and I finished it off with rhinestones. I received this cute little birdie from Embellish-It along with the paper, I'm Like a Bird and One Fine Day from American Crafts, all available in the store. Don't they look great together. I wanted my bird to stand on a branch, so I used my Cricut Joys of the Season to cut a little branch and used some Prima flowers to embellish the branch. The flowers in the upper right corner are Primas and finished off with Dew Drops and Martha Stewart Branch punches. 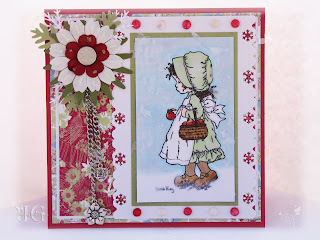 I used an old Stampin' Up! stamp for the sentiment "It's Your Day." I wanted to add a little wing to the bird, so I stamped on some green paper and mounted with dimensionals. You can sort of see the shadow in the picture above. Go check out Embellish-It. 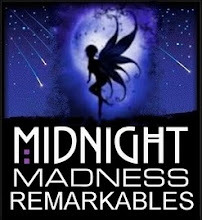 She has a ton of SALE items and is offering Free Shipping on domestic orders of $50.00 or more! Enter code 4SP9HD in the coupon box at checkout! (One discount per order). 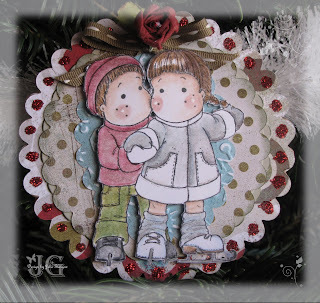 I created this ornament for the Embellish-It Friday Free For All Challenge 72. After the process was complete, I let the Copics dry for a short period of time. 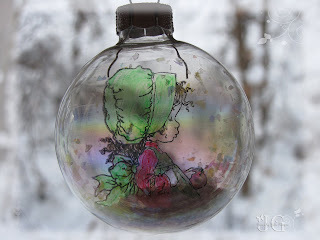 I then curled the acetate around a pen and fed it into the ornament. I added some iridescent snow, some ribbon and a rose to the top and voila. I love this image because it is so versatile. It can be used year around. Try this out. It makes a thoughtful gift for family and friends. Oops, I am a bit late. 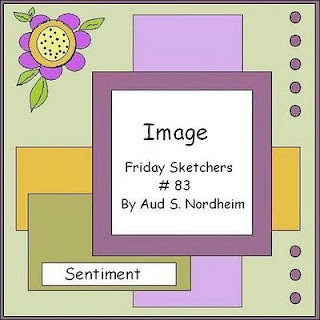 However, I created this card for Sketch Saturday #78, so figured I would share anyway. I used Cookie Girl by Whiff of Joy. I colored her with Prismacolor Pencils and mineral spirits. The designer paper is Figgy Pudding by Basic Grey. 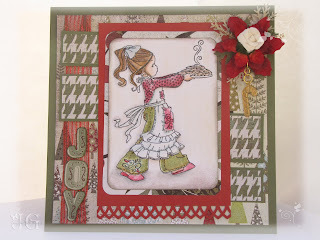 JOY was created with Martha Stewart letter stamps. I wanted to play some more with the 3-D images. It is sort of hard to see in the picture, but you can see the shadows from the layers. The flower is Prima's Poinsettia and an extra rose to top it off. The base is created with the Martha Stewart Branch punch and a leaf punch. I added a candy cane charm from my stash. Thanks for stopping by. I hope you have a fantastic weekend. I am so honored to have been selected to be a guest designer for Embellish-It Scrapbooking (see sidebar for link) for the month of December. 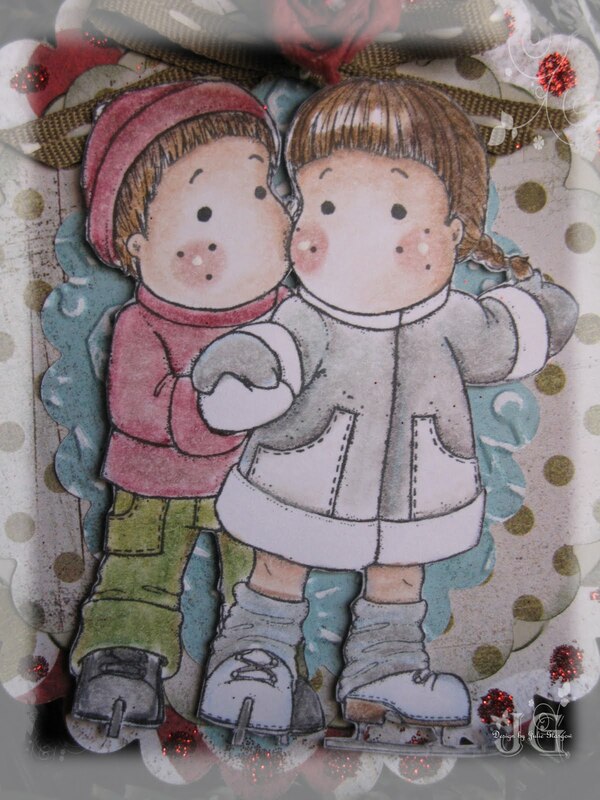 So, I will be posting each Thursday using stamps and supplies that can be found at this terrific online store. 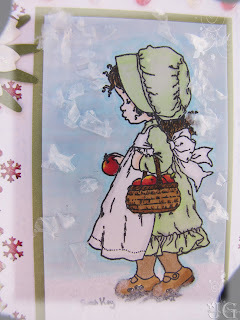 For my first card, I am using Time for Apple Pie by Sarah Kay. The background paper is Euphoria by Basic Grey. Both the stamp and the paper can be found at Embellish-It Scrapbooking. 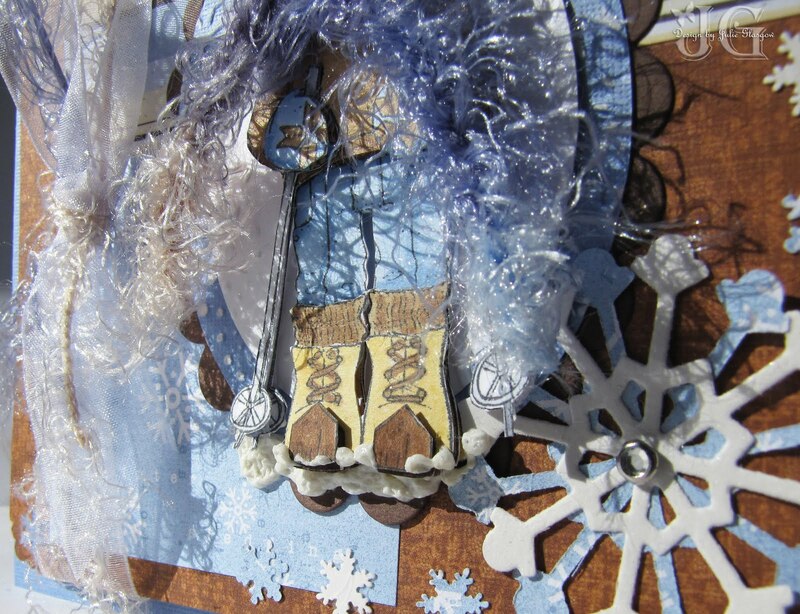 I used my Fiskars border punch for the snowflake borders. I colored my imaging using Copics. I added a little C1 gray to the green to soften it a bit. I wanted to give a real snowy feel to the card, so I added flock as a base under her feet. I then added some faux snow that I found in a Christmas display last year. The snow is usually used to decorate a home, but I love the feel of falling snow it adds to the picture. 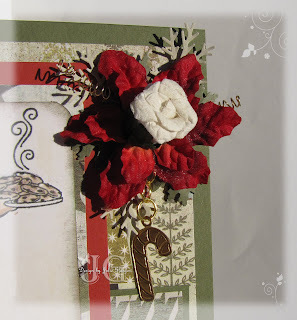 I layered some paper flowers for the embellishment. I used Martha Stewart leaf and branch punches for the flower base. 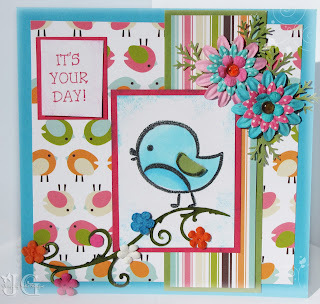 I topped it off with a Hodge Podge brad from Stampin' Up! and finished it off with some charms for a little extra zing. It is hard to see in the picture, but I included Stickles to the flower to add a little more pizazz. 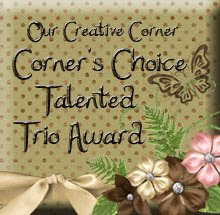 Go visit Embellish-It Scrapbooking to see their great selection of stamping/scrapbooking supplies. Also check out the sale items as they are offering some great deals right now. Check quick as you don't want to miss this sale. Have a fantastic day! 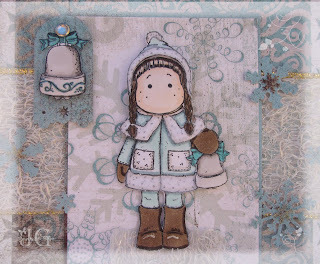 I used Tilda With Bell and the Bell accessory from Magnolia. The paper is Figgy Pudding from Basic Grey. The fuzzy ribbon is from my stash. I added some jewels to the top and bottom for a little extra bling. I added white Fun Flock to Tilda's coat collar and bottom. I cut some of the ribbon to plant under Tilda's feet to give the appearance that she is standing in snow. As I have mentioned before, I have been playing with 3-D. I love that effect on a card. I even layered the bell to make is pop. Check back tomorrow for another Christmas card. Tis the season. I got busy for Christmas Saturday. 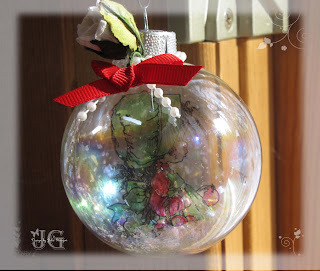 We got and decorated our tree, which gave me the oomph to create some ornaments. 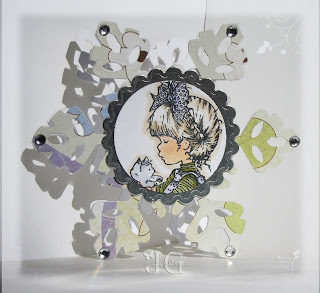 I used my Bigz scallop circle die to cut chipboard and designer paper (Figgy Pudding by Basic Grey). I added a little glitter to each of the scallops. I found some lovely flowers in the bridal section of Michael's. I used Prismacolor Pencils wtih mineral spirits and a blending stump to color my skaters. I had fun with Tilda's jacket, mixing turquoise and gray to give it a material feel. This ornament was created with the Stampin' Up! Lattice Bigz Die. I used two pieces of chipboard. 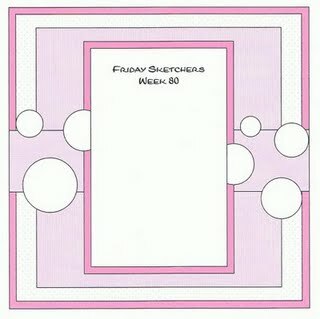 The center is part of a plastic notebook divider, originally used to create a punch sampler like the one Stampin' Up! offered at 2009 Convention. This was part of the piece I had left over. I covered the chipboard with two-way glue and glitter. 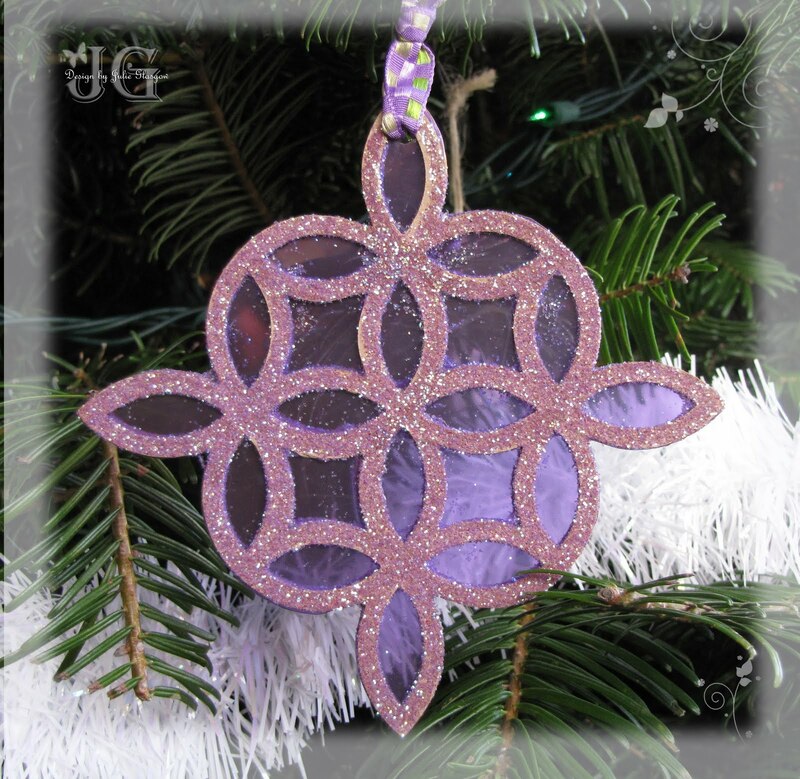 Super simple and beautiful on the tree. Paper:DCWV textured card stock, Classic K Bailey (K&Co), SU! DSP. 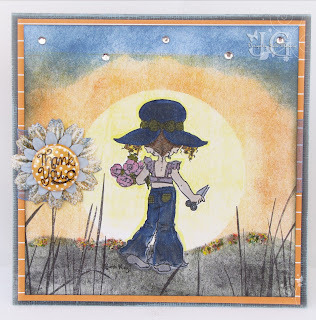 The other inspiration for this card was my desire to use crochet flowers on my cards. So, I got out a small hook and some yarn and started to crochet. I was really just playing around, but liked the scarf look of a chain stitch with the fuzzy yarn. 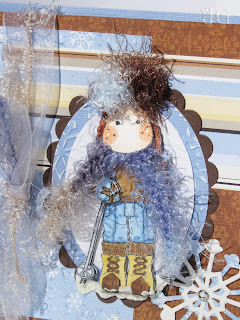 I put together a hat as well, and voila, a stylish skier. I should note that I carried the fuzzy yarn a little further and tied it with the organza ribbon. 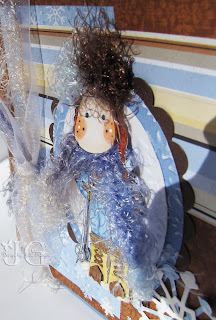 I wanted to create a 3-D Tilda to emphasize the scarf. I love how it adds dimension to the image. 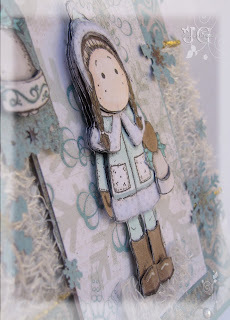 I also added some "snow" with liquid applique to ground Tilda to the card. I love the 3-D Tilda and the idea of "dressing" her. So, watch for more projects like this.